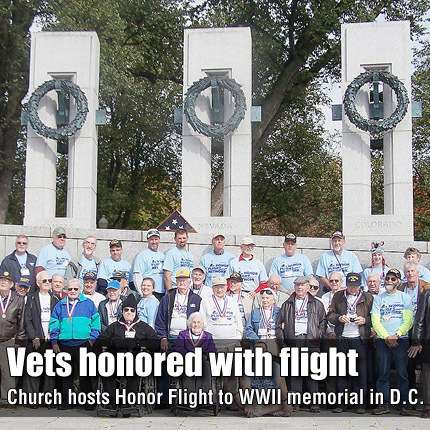 Twenty-five World War II veterans from Kansas and Missouri took part in an Honor Flight to the WWII memorial in Washington, D.C., with the help of volunteers and guardians from Grace Community Church, in Overbrook. OVERBROOK—Months of planning commenced Friday as members of Grace Community Church (GCC), Overbrook, hosted their second Honor Flight, taking 25 area veterans to visit the National World War II memorial in Washington, D.C.
“It was a very emotional trip,” said Marshall Madill, Overbrook, on of the several volunteers assisting with the trip. The flight including veterans from Lawrence, Topeka, Tonganoxie, Wichita, Leawood, Ottawa and Missouri. Several vets chosen from waiting lists on the Honor Flight Network along with a few were relatives of members of the church, including Madill’s uncle, Wayne Madill, Wichita. The group left GCC around 3 a.m. Friday morning. They arrived in D.C. just before 10 a.m., and spent the rest of the day visiting sites around the city, including the WWII, Vietnam and Iwo Jima memorials. They spent the night in the city before flying back in the morning. It was the first overnight Honor Flight by an area organization. Spencer, superintendent at USD 420, has made several Honor Flights with Lyndon High School, in addition to helping start programs at Southern Coffey County, Concordia and Jackson Heights. It was the church’s second flight, and Spencer’s 12th. While at the cemetery, Spencer and other guardians on the trip slipped away to find the burial site of Rufus Poole, husband of veteran Edna Pool, 93, Lawrence, who was on the trip. They first found the grave of a civil war veteran buried in 1960, but later made their way to the columbarium where Rufus Poole’s remains were kept. It was the first time Edna had been to see the site of her husband’s remains since his death in 1985. “I was deeply pleased to be able to visit the actual site,” Poole said. “It had been a lot of years. Edna served from 1942-47, first in the Aleutian Islands and later ending the war in a field hospital attached to General George Patton’s army. Rufus Poole served in the Navy for 10 years, but the two met in their hometown of Colby, where they lived until his death. She moved to Lawrence shortly after to be with family. Edna had contacted a previous Honor Flight in Holton, but was referred to GCC Pastor Rodney Caldwell. Caldwell was in charge of organizing veterans for the trip, but was also able to accompany his grandfather, a WWII veteran from Tonganoxie. The trip was also Caldwell’s first Honor Flight experience. • For more information, or to donate, volunteer or participate in the Honor Flight Network, visit www.honorflight.org.